Ricky is 34-years-old and has been with Mustard Seed Communities for over 20 years now. He uses a wheelchair because of his scoliosis but that doesn't keep him from doing the things that he loves. Ricky especially enjoys meeting new people and making friends with all the mission volunteers that visit. 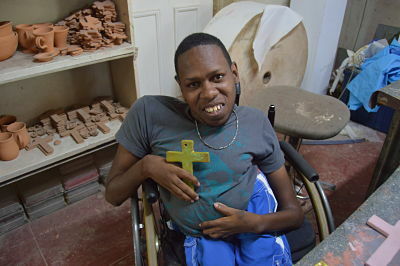 Three years ago Ricky also started working with our Master Potter, Patrick, in our Pottery Studio at Mahoe Drive in Kingston, Jamaica. He loves making ceramic crosses and angels, like the one he's holding in this picture. We love seeing how happy working in the studio has made Ricky!